Mass-Producing Lead Weights for Scout Use? Re: Mass-Producing Lead Weights for Scout Use? Here's my perspective on this and I'm sharing only to throw this out for consideration. Reasonable people can disagree. Tungsten is basically free. Just figure out a way to reuse it (without destroying the car). You can use the tungsten for several years then sell it. You'll get most of your money back. Think of it has an inflation hedge. Its better than saving the money in a mattress for several years..
LightninBoy wrote: Just figure out a way to reuse it (without destroying the car). I'm not saying it can't be done, but the times I've used tungsten, my designs have been such that removing the tungsten would destroy the car's design. Granted, there may be certain designs where that is true. But there's no reason it should be true with a typical "pro style" build where cubes are involved. Most people just use too strong of glue. Stan Pope wrote: A relatively easy and long lasting mold can be made from two 2' of 2"X1/4" structural steel angle iron. 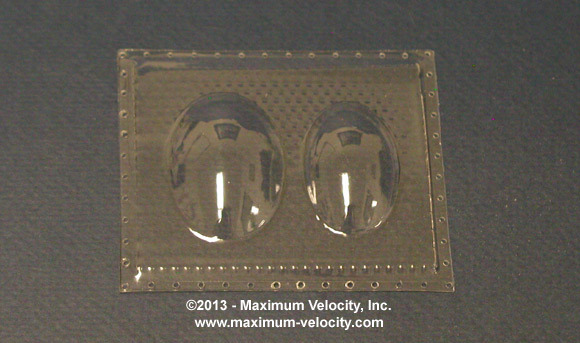 In use, fill the mold holes to various depths to produce weights ranging from 0.5 oz to 1.2 oz. Working alone I suspend one end of the mold from the ceiling so that it can be drifted under the melting pot pour hole. One hand guides the mold while the other hand controls the flow of the melt. To release the slugs, remove the two end bolts that hold the T together. This sounds interesting, but I'm having trouble visualizing the actual mold. I'm going to read it a few more times before I bug you for clarifications. Darin McGrew wrote: I'm not saying it can't be done, but the times I've used tungsten, my designs have been such that removing the tungsten would destroy the car's design. I can see the tungsten cubes,bars,plates & canopy's being reused.. more so then the 1/2 ounce cylinders and rounds. Maybe the smaller 1/8 ounce or 1/4 ounce cylinders could be used like cubes in thin body car with square weight pocket designs also. For the pro built cars were cubes or bars are the most used weight types..In a square weight pocket with a thin wood top. Most will use some good double side tapes or carpet tape. with foil or HVAC tapes even monokote to hold the weight in place. As a pediatrician and pinehead I thought I would weigh in (note the weight pun). To my knowledge the exposure to lead if handled briefly (not put in mouth or melted) to a scout aged child in minimal. Now if you melt it or aerosolize in dust and expose over time we are talking something else. Also lead is most toxic to the rapidly growing brain which is the case with infants (ie the one who eat paint chips) and less so in school aged kids. I bought 3/8 in lead wire and cut them myself into 1 in segments. I let the kids pick them up, drop them in the holes we drilled and cover over with wood putty, then wash hands. Let me read some recent article and get back to you all. Thanks, Noskills. That matches the researched information I've seen about lead exposure. Noskills wrote: Let me read some recent article and get back to you all. You forgot to add that kids adsorb up to 70 percent of lead. whodathunkit wrote: I can see the tungsten cubes,bars,plates & canopy's being reused..
Do they make cosmetic canopies that are compatible with the tungsten canopies? That would allow the car to be displayed with a (cheaper) cosmetic canopy in place, while the (expensive) tungsten canopy is reused for future cars. Hmm... It doesn't look like they plug into a mounting hole the same way as the tungsten canopies though, so it isn't quite a simple matter of swapping the expensive tungsten one for the inexpensive copy for display purposes. A lead canopy, would be an easy cheap alternative to replace the tungsten canopy. knotthed wrote: A lead canopy, would be an easy cheap alternative to replace the tungsten canopy. Except that the lead canopies I've seen online aren't all that cheap, and they don't have a mounting stud that plugs into a hole the same way as the tungsten canopies. Using a tungsten canopy to make homemade lead copies might be cheap, but it wouldn't be easy, and it would still involve the same exposure to lead as using lead weights in the first place. You Pou a second board with a hole (mounting stud) on the board that is the negative of the canopy and you get a nice 2 piece mold. Darin, if it's just for display purposes, why not use a gray two part epoxy in the canopy mold? You could either mold in a mounting stud or insert a dowel before it hardens?